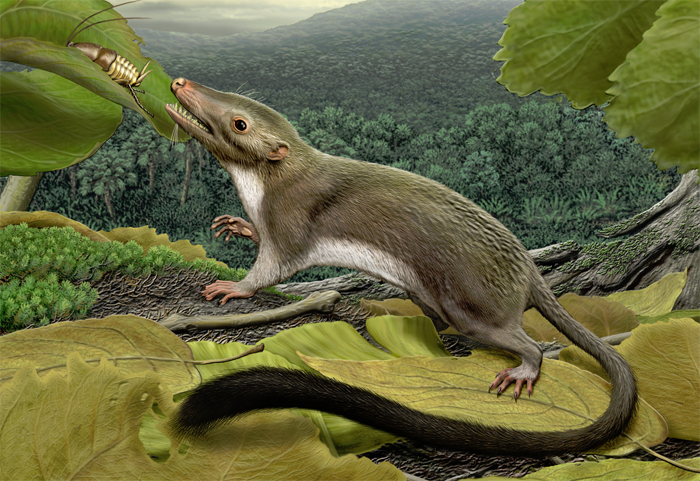 Your earliest ancestor, or: Science is neat. I don’t know about you, but when I see highly detailed illustrations of animals that have been extinct lo these tens of thousands of years – I quietly call shenanigans. Because honestly now. You can’t know that! (I think to myself. Quietly). But then I saw this yesterday and thereupon became edumacated! Also my mind was blown. — that’s every human, monkey, bat, dolphin, lion, pangolin, shrew, antelope, and sloth. To reconstruct their ancestral creature, the team studied 80 placentals, both living and extinct, and painstakingly analysing each one according to around 4,500 different anatomical traits. All of these details went into the reconstruction. Then, as with many palaeontology papers, the team turned to an artist to bring their work to vivid life. And as with many palaeontology papers, that artist was the great Carl Buell. The group I worked with on this worried about the size and placement of every cusp on every tooth, the texture of the hair, the placement of each and every chin and facial whisker, the number of pads and placement of pads on the feet… and the shape, size and hair on the ears. My mind? As I mentioned: It’s blown. If you want to see a bigger version of the illustration on which Buell and his team worked for five years, click here. If you want to see a really big/zoomable version (so that you may, as Yong writes, “gawk at every agonisingly crafted detail”), click here. Ahead of the State of the Union address – call Congress about gun violence. And now: A penguin highway. Gotta love the crunch those teeth are gonna put into that bug: why this mammal smiling answered. Did you click on the link to embiggen? Those teeth look like they could *really* get the job done! Not to mention that is one big bug–a whole face full of bug.